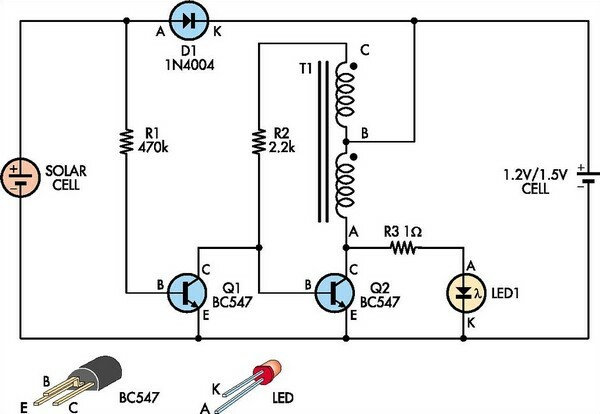 This white-LED driver circuit is ideal for use in a garden light. It automatically turns the LED on at night and runs from a single 1.2V nicad cell which is recharged by a solar cell during the day. The prototype used the existing casing and solar cell from an old garden light but you could also use a solar cell from a solar education kit. Diode D1 allows the solar cell to charge the battery during the day and prevents it from discharging back into the solar cell at night. Transistor Q1 controls the LED driver circuit. This transistor is normally on during the day (ie, when there is output from the solar cell) and so Q2 and the LED are off. At night time, Q1 is off and this allows a simple blocking oscillator circuit based on T1, R2 and Q2 to operate. This circuit in turn drives LED1 via a 1W resistor which limits the peak current into the LED. T1 is wound bifilar, with the two windings configured to produce a center-tapped winding. Winding AB is the main primary winding and winding BC is the feedback winding. The number of turns and the core used are not critical. The prototype worked with a toroid scrounged from an old computer power supply, as well as with a small ferrite suppression bead and an Altronics L5110 core. The toroids were wound using 10 turns of 0.25mm wire, while the ferrite bead worked with just five turns of 0.25 mm wire through the hole (that's all that would fit). The oscillator works like this: when Q1 turns off, current flows through R2 and turns Q2 on. This causes current to flow through winding AB and the core produces a magnetic flux. And that in turn causes end C on the transformer to rise above the battery voltage and turn Q2 on hard. When the core saturates, the voltage at C drops back to the battery voltage, thus reducing the current in winding AB. As this happens, the flux in the core starts to fall and this causes the voltage at C to drop below 0.6V. As a result, Q2 turns off and because there is now no current in AB, the flux in the core starts to collapse. What happens now is that the voltage on end A of the windings rises above the battery voltage. When it gets to 3.2-3.6V with respect to ground, LED1 "fires" and current flows from the battery via BA, through the LED and back to the battery. When the flux is spent, LED1 turns off and end C returns to the battery voltage. Current now flows through R2 and into the base of Q2 and the whole cycle starts over again. Finally, when the Sun rises the following morning, Q1 turns on, robs Q2 of its base drive, the oscillation stops and LED1 goes out.